Photograph 1 - Daytime view of the Ballagio along the Strip, Las Vegas. Photograph 2 - Guess where we had dinner tonight?? We are now in Las Vegas and in Tower 2 of the Signature Hotel – great accommodation. Now, for a couple of hilarious stories about our flight from Washington DC to Vegas. Whilst waiting to board our flight there was a crazy woman….Chinese…young…wearing a complete mountaineering overcoat that you could only see her face because a hood was over her head. She had this trolley with many, many used paper towels and some electronic items. It was quite noticeable that she had some form of compulsive disorder as she constantly was wiping her face with paper towels. When we boarded the plane she was the last passenger to embark (we were sitting in Seats 1Aand 1B and can see everything from first class) and when the aircraft was ready to taxi out she informed one of our attendants that she had left her mobile phone in the terminal. “Get back to your seat” was quickly ushered and she scampered back to coach class nonchalantly. We believe there was trouble down there for the entire journey. I pity the poor person who had to sit next to her. Now about our flight. We had this black American flight attendant and this is how it unfolded once we had settled in………(with both hands in her pockets) “I’m your attendant for you 12 honkeys in first class” (yes we were all white-skinned passengers)……….”I’m looking after you-all, RIGHT!”............ “for the next 4 hours and 38 minutes just call me if you want anything”…..”oh by the way, there’s no meals – I can only offer you snacks and drinks”….”so there!”…..”if you happen to press the call attendant button instead of the light button, press it again and it turns off”. This delectable person was built like brick s@$#house” – her hair was not conducive to our regular flight attendants we have seen in the past. As you can understand in the above dialogue her language was something between the star that had played “mammy” in Gone With The Wind and from one of the black Harlem women in New York City. Nevertheless, the remaining time with her was okay – she did give us some wine in a plastic water cup and that packet of potato chips (crisps). An appraisal of US Airways – don’t fly with them!!! They are a “bare bones” air carrier that flies hundreds of routes across the States (and some International routes). They are little bit more expensive compared with their competitors (American, Delta, United). In coach you get a seat that has no leg room, seats don’t recline (it is permanently fixed) , no pillow, no blanket, no meal, no entertainment, no overhead screens, unfriendly flight attendants, you pay for bags that have been taken at check-in (the consequence of this are the majority of passengers bring into the cabin many oversized bags – some don’t fit into the overhead luggage rack) and this is for long journeys across the continent (four to six hours) - you have to sit in your seat like stunned mullets! In first class…well….you’ll get a seat that reclines and a pillow and blanket and that luxurious leg room. You’ll get off first and your bags are priority baggage – that’s it. First class tickets holders can’t get you in their Lounge even when they promise you entry when you purchase your ticket. Our recommendation for anybody who needs to travel across the States – DON”T FLY US AIRWAYS. We now appreciate our QANTAS and even Jetstar now that we have experienced US Airways. What did we do today in Las Vegas? Being three hours behind the eastern side of US we got up early. There was a long walk donwn the strip and Anne shopped and shopped – Macy’s and Ann Taylor fashion stores was the go and she had hit our savings pretty hard. We did have lunch in the Fashion House food court for that excellent “blackened fish”. With veggies and noodles it was one of the best “grilled” fish we had. From Macy’s we caught a cab to Wal-Mart and bought drinks, munchies, a cabin bag and cooler bags for our next country drive across western US as planned starting tomorrow. We will be driving for the next 30+ days and there will be plenty of hot desert crossings. Speaking about temperature – Las Vegas is a dry 36 deg C location - a beautiful summer’s day here - sorry about the cold weather Sydney is experiencing at this moment. 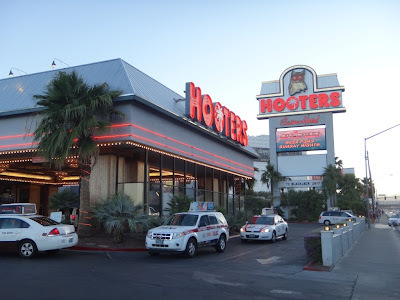 We had dinner at Hooters - cheap meals and a great family restaurant. Tomorrow night we are staying at a resort near the Grand Canyon South Rim. We will be staying there for two nights. Cheers.